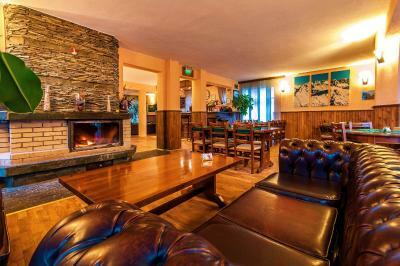 Lock in a great price for Hotel Avalon – rated 9 by recent guests! A warm welcome from all the staff at Avalon, good location central to town, and the free shuttle up to the Ski Hire centre near the Gondola every morning. Rooms are basic but clean and comfortable. Limited, but decent breakfast, and a great curry night ! Hotel even lays on decent hot soup and cake in the afternoons when returning from a hard day on the slopes ! Aro the wonderdog ! Great massage available. James/Dani were also very helpful with any requests or questions. Room and Hotel was always warm, plenty of hot water always available. 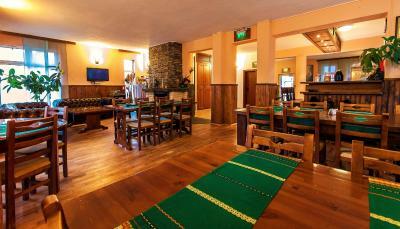 Would definitely stay here again if returning to Bansko. Lovely home from home atmosphere. Easy to relax. The Curry! 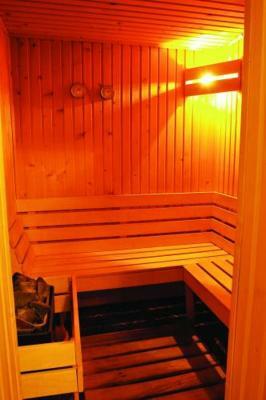 The Sauna! Really made to feel welcome and no request was too much trouble. Fantastic curry night and the best cocktails, with plenty of advice on where to eat out. Lots of hot water for tired skiers. Great massage in-house, also sauna and hot tub. James really tries his best to make sure guests are well looked after. Cosy hotel with all necessities for a weekend city break. Unique service named "Second Breakfast", between 15-18h. After all day sport, there was hot soup and delicious cake. You should try the cake. Great hospitality. Very good price for the services offered. היחס האישי , האווירה, ארוחת הבוקר , הנוף מהחדר. אהבתי מאוד את ארוחת הערב בסגנון הודי. פשוט מדהימה. Номера комфортные, теплые, чистые ( номер 23 и 24), хозяева и персонал очень любезные , дружелюбные и приветливые. хороший завтрак. номера и отделка ресторана в национальном стиле, красиво. все очень приятное. и чистое. расположено в центре старого поселения. удобно и близко к любому месту для прогулки. в номере есть фен, чашки, чайник и комплиментарный чай и кофе. внизу в баре сделают прекрасный кофе из машины. бар работает и ночью. но мы не пользовались, а шли в номер и отдыхали семьей. один русский канал ( первый). 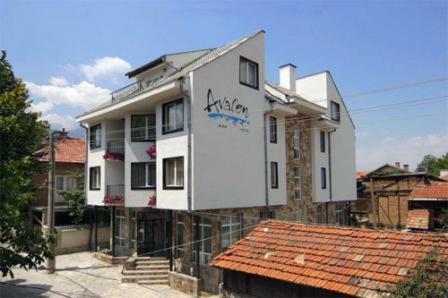 Overlooking Pirin Mountains, Hotel Avalon is located in a quiet residential part of Bansko, only 1,950 feet from the elevator station and 1,650 feet from the Old Town. The main Pirin Street is just 150 feet away. The Avalon has been fitted out to the highest standards using local materials, the furnishings have been hand made combining local craftsmanship with modern style. All rooms feature internet access. 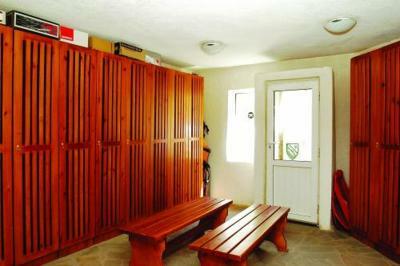 Facilities for storing and drying your ski equipment are available on site. 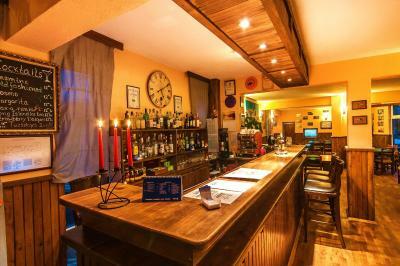 There is a relaxing lobby bar and restaurant offering French and Italian food and a fine selection of local wines. An Indian buffet is offered on Thursdays. Complimentary soup and afternoon tea are also available. 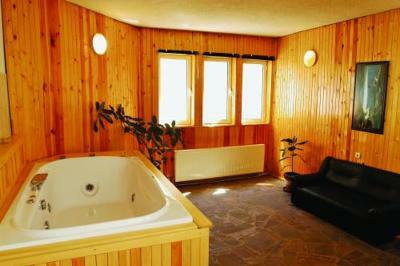 In the basement there is a sauna, hot tub and massage services. For guests' convenience shuttle services to the ski elevator are offered, against a small charge. When would you like to stay at Hotel Avalon? Spacious room with 2 single beds and a bathroom. In-room facilities include a safe, Wi-Fi and cable TV. There is a double bed in the master bedroom and a bunk bed in the second room. 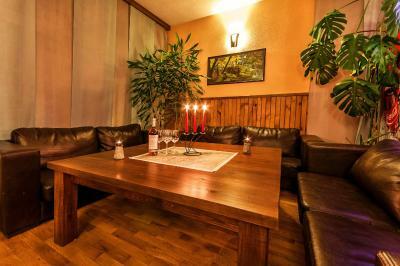 It comes equipped with cable TV, Wi-Fi a fridge and a terrace or balcony. House Rules Hotel Avalon takes special requests – add in the next step! Hotel Avalon accepts these cards and reserves the right to temporarily hold an amount prior to arrival. Please note that the hotel does not accept American Express as a guarantee of your booking. Nothing…..especially at the price paid.